Lucas Pouille, after his demolition in this year’s Australian Open semi-finals by Novak Djokovic, summed things up concisely. Certainly, Djokovic had looked very impressive indeed against the hapless Frenchman: He dropped only eight points on serve in the match; offered not a single break chance; made 24 winners for just five unforced errors; ended the match with twice as many points as his opponent. And he had conceded only four games in the match. And bearing in mind it was his 67th win in at the Australian Open, where he was already a six-time champion, that was some statement. But then he had come into the tournament this year as the favourite to win a record seventh title on the back of a stunning comeback from injury. This time last year, Djokovic was in the midst of a relative slump with an unresolved elbow injury, but after losing in the quarter-finals, he bit the bullet, had minor surgery, and the rest is history. The wins started to come on the clay of early summer, and after losing a close final at Queen’s to Marin Cilic, he would lose just three more matches to the end of 2018, winning Wimbledon and the US Open, closing the Masters golden circle with the Cincinnati title, plus lifting the Shanghai Masters trophy. But Nadal has had more than his share of injury over the years, and 2018 was no different—not least in forcing his quarter-final retirement in Melbourne last year with a hip injury, and then withdrawal from the tour after another retirement at the US Open, this time with a knee problem. But from the moment the 2009 Australian champion and four-time finalist hit Australia after four months away from competition, it was clear he had used his time well: He was rested, recuperated, and had a niggling ankle issue resolved by minor surgery, too. But he had worked on a lot more besides—perhaps from a determination to follow the example of his older colleague, Roger Federer, and change things up in his game. Nadal’s serve looked flatter, faster and more destructive, plus he showed a greater willingness to take early control of rallies, come to the net—a previously underused part of his game considering his volley and overhead skills—and win from the front. In a career packed by long matches full of long rallies, here was a man taking the initiative, determined to keep his career burning for a few more years. He subdued opponents both young and old, before finally dismissing the precocious talent of No14 seed Stefanos Tsitsipas for the loss of only six games. Indeed on paper, Nadal’s progress had looked cleaner and swifter than Djokovic’s: not a set dropped, just one tie-break faced, little more than 12 hours on court. The Serb, in comparison, lost two sets along the way, and his 12 fewer minutes on court were down to the retirement of his quarter-final opponent, Kei Nishikori, after 12 games. Perhaps the tournament could expect little else from two top-ranked men in Melbourne, but this final was about a lot more than their supreme form of the last year or so. For theirs had already become one of the greatest rivalries in men’s tennis, the most played and evenly balanced rivalry ever—27-25 to Djokovic. They were about to play their 25th tour level final, an Open era record, and the winner would add new records to their glittering resumes. If Nadal won his 18th Major, he would become the first man in the Open era to complete the career Grand Slam twice, and the third man ever to do so. If Djokovic won his 15th Major, he would rise to third on the all-time list of men’s Major titles, behind only Federer and Nadal and ahead of Pete Sampras. He would also claim a record seventh Australian title—no longer tied with Federer and Roy Emerson. Yet in the face of all these huge numbers, one more thing made this final special. It would bring together these two giants of tennis at the Australian Open for just the second time—and the first, back in 2012, was the longest Major final ever contested, a humdinger that lasted just seven minutes short of six hours. Djokovic edged that one. Seven years on, again ranked Nos 1 and 2, just as they were then, could Nadal get his revenge? It was not a great start for a nervy Spaniard: He lost the first six points, and that would extend to 11 from 12 for Djokovic, who raced to a 3-0 lead with two love holds. Nadal looked tight, Djokovic steely. Nadal’s brow was furrowed, even more so as he faced break point again in the fourth game, and that after a testing baseline rally ended in a forced error. But this time, he dug in, as that wide swinging serve and follow-up got the hold—and a first fist pump. But Djokovic was not for breaking—a third love hold. The shackles seemed at last to have fallen from Nadal, and his big serve and net charging began to emerge. He held, but Djokovic continued his perfect opening, a love hold for 5-2. And after just 36 minutes, the six-time champion served it out, 6-3, having dropped just one point on serve, and struck 12 winners for three errors. It had been as clean, smart and devastating a set as anyone could wish for. Nadal held his two opening serves in the second set, but come the third, Djokovic smothered his attack, defusing any plays to the net with counter drops and lobs. The break was swift, 3-2, so Nadal dropped back into his old familiar game, trying to apply more weight to his shots, and he got the first sign of a breakthrough in the next game, his first deuce. He pulled off his famed running forehand winner for a second deuce, and the crowd responded, but the chess-like placement of the ball from Djokovic—inch-perfect length, angles switched from corner to corner—snuffed the chance, and instead, the Serb broke again. Two minutes more, and Djokovic had served out the set, 6-2, with three aces. Nadal simply had no answers, and the zip and variety he had brought to his previous matches were missing. Perhaps it was the cooler and windier conditions; perhaps it was the lack of gaps in Djokovic’s armour that brought greater tension to the Nadal arm. The Spaniard held his opening game of the third, only to see another love hold whip past on the Djokovic serve. And with his bread-and-butter shots going awry—a 25th bringing up break point—this was unfamiliar, uncomfortable territory. Djokovic threw in a disguised drop shot that even the legs of Nadal could not reach, and broke, 2-1. A 28th winner was accompanied by a roar of satisfaction for another quick hold, 3-1, and Nadal’s brows deepened. But for once, his ‘new’ tactics worked, he plunged to the net for a volley winner and held. Then a rare Djokovic error brought up Nadal’s first break chance of the match, only for Nadal to net a regulation backhand. Djokovic roared at his resistance, tapped his head with his racket, thumped his chest with this statement hold. Nadal had another glimmer of a chance in the eighth game, deuce, but still could not penetrate the armour. Two huge winners from Djokovic, one to the forehand, one the backhand, and he had two match points. One final error from Nadal concluded one of their most one-sided Major matches, 6-3, after two hours—their shortest completed best-of-five contest. 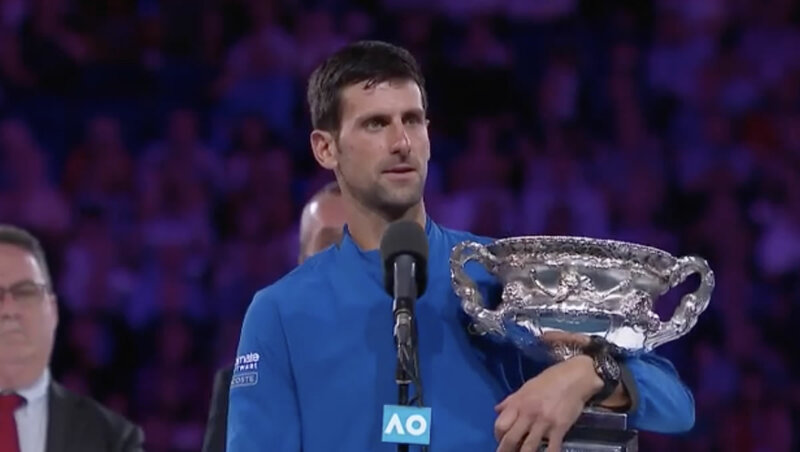 The statistics were all in Djokovic’s favour—more winners, break points, net points, serving percentage, receiving points—to bring an outstanding conclusion to an intriguing tournament. The Serb has now left Sampras in his wake, and outstripped Federer and Emerson in Australian titles. Perhaps most significant, he has become the first man to win three consecutive Majors for the third time in his career: He also did it in 2011-12, and in 2015-16. And looking at his dominance over his biggest rival this weekend, it would surprise no-one if he repeated that last run to win the French Open too, hold all four Majors at once. “Has been a very emotional two weeks, even if tonight wasn’t my best day, I had someone who played much better than me. I have been going through tough moments the last year, and since the US Open I was not able to play a professional match until the first round of the Australian Open. Even if tonight was not my night, it was important to be where I am today again, coming back from injury. It is hard to disagree: It is truly amazing.